Returning from the Golden Circle tour, we’ll drop you off at your hotel in Reykjavik where you'll have plenty of time to rest, recharge and prepare before we pick you up again for the second part of the tour,- pick up for the Northern Lights tour starts at 20:30. Easy to purchase. Gray line was very responsive to my questions. We saw the Northern Lights, eventually. My girlfriend and I were very pleased with this tour on the whole. We CANNOT FAULT the Golden Circle tour during the day. Pick up was on time and our tour guide was polite, funny and very informative. We learnt alot about the country's history and culture. Photos DO NOT JUSTIFY just how beautiful the landmarks are. Gullfoss Waterfall and the Geysirs are both sights to behold. The 4 hour break back in Reykjavik is perfect and gave us the chance to refresh and eat dinner before heading back out. The Northern Lights tour in the evening was good as we managed to see the lights faintly, however do wrap up warm as it gets very cold late into the night. We will definitely be using Gray Line again next time we visit Iceland. Taking the Golden Circle tour is an absolute must any visit to Iceland. 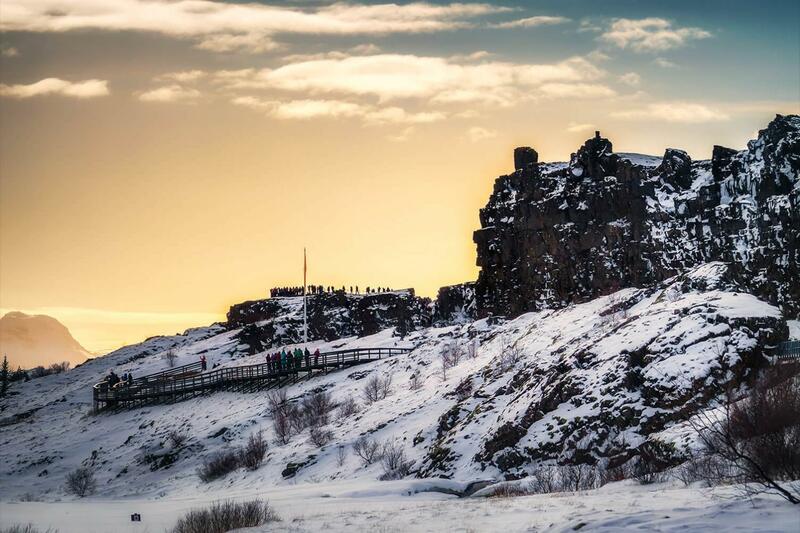 You can’t say you’ve been to Iceland if you haven’t seen its natural and historic wonders. 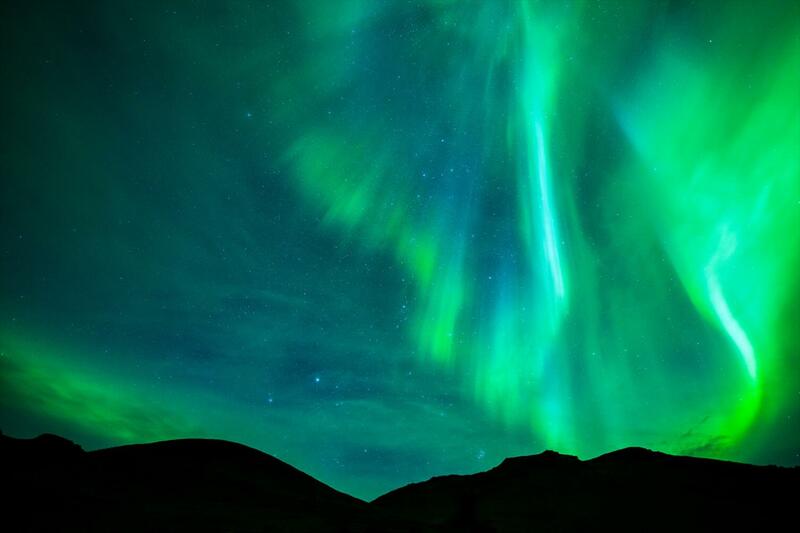 And you won’t want to pass up the chance to see the Northern Lights stretching across the night sky. 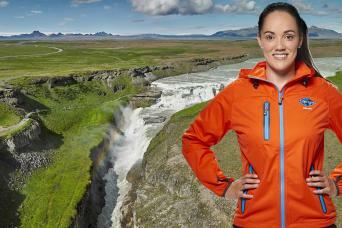 Our knowledgeable guides are the key to unlocking these uniquely Icelandic experiences. Our first stop in the Golden Circle will be Þingvellir. It was in this place, back in 930 AD, that the Althing, the world’s longest running democratic parliament, was formed. It’s also one of the few places in the world where you can walk inside the rift between the North American and Eurasian plates. 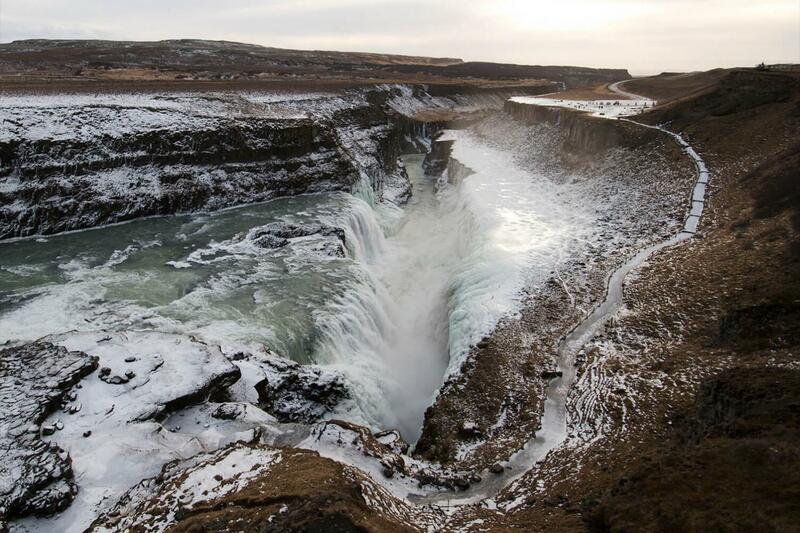 Gullfoss is one of the largest and most striking waterfalls in Iceland. It’s many tiers of rushing water make it both majestic and a challenge to photograph in its entirety. The tier formation also means that on sunny days you can find multiple rainbows in its mist. You simply have to see it with your own eyes. 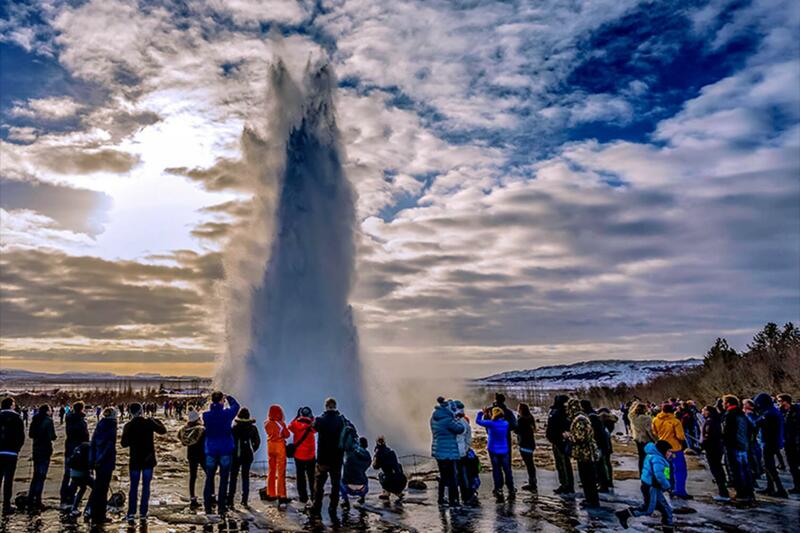 At the Geysir geothermal area, we’ll be treated to one of the most iconic sights in Iceland: an erupting geyser hurling boiling water up to 30 meters high every 3 to 7 minutes. After a short stop at Faxi waterfall and its fish ladder, which allows salmon to “climb” upstream, we reach the historical site of Skálholt church, our last stop on the Golden Circle. After touring the Golden Circle we’ll drop you off at your hotel in Reykjavik in time for dinner. You’ll have plenty of time to refresh yourself and pick up more warm clothes before we begin pick up for the Northern Lights tour at 20:30. Viewing the Northern Lights by oneself can be tricky but our expert guides know how to find the best viewing locations. We’ll leave Reykjavik’s light pollution behind and head for destinations where you’ll have the best chance to see and photograph the lights. 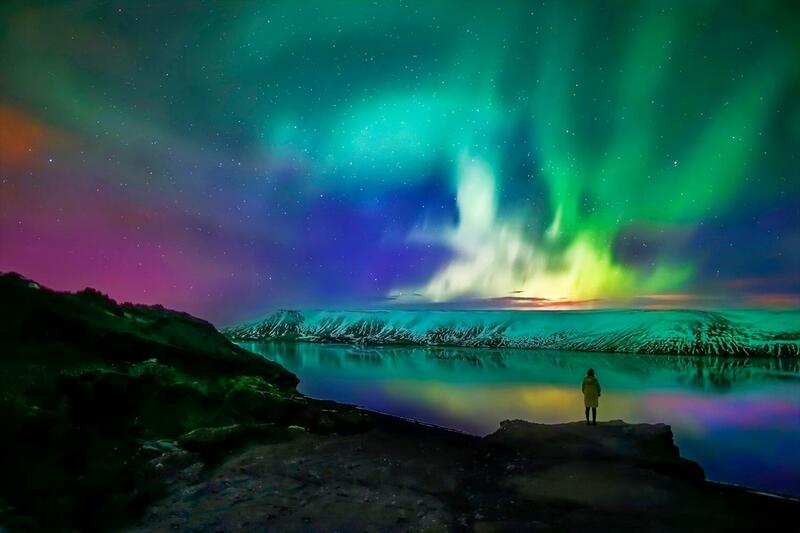 From its splendid daytime vistas to the dancing lights of the night, experience the essence of Iceland. Don’t miss out on your opportunity to walk through Iceland’s history, awe-inspiring landscapes and go on a quest for the Northern Lights.